A buildup of excess keratin in the skin can cause Keratosis pilaris, a benign condition characterized by small bumps and redness, and Actinic keratosis, which triggers rough, scaly patches and can develop into skin cancer. Treatments for both ailments, ranging from sulfur soap to acid washes to surgery, are unpleasant, invasive, and for many patients, ineffective. 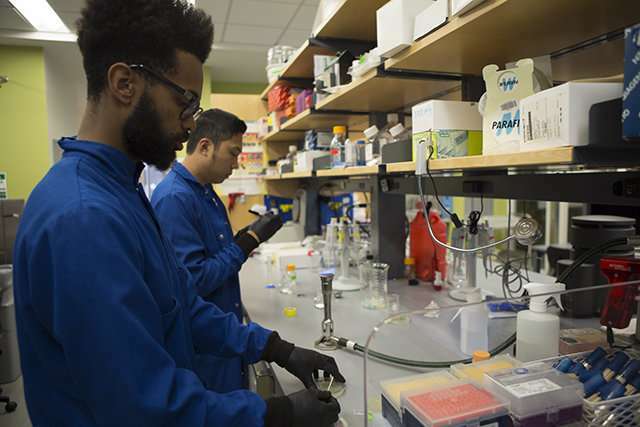 A better treatment may originate from an unlikely source— Escherichia coli bacteria, according to a team of students at the Harvard John A. Paulson School of Engineering and Applied Sciences. 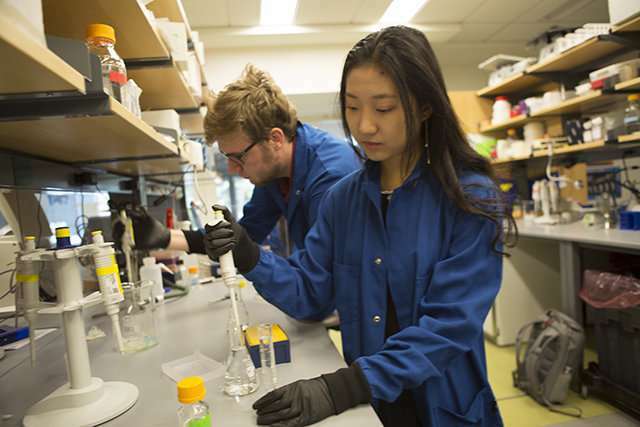 The students, members of the school's International Genetically Engineered Machine (iGEM) team, genetically engineered the bacteria to secrete enzymes that target the buildup of keratin in the skin. "Most of the current treatments for Keratosis pilaris and Actinic keratosis involve cutting off the condition, freezing it, or burning it off with acid, and they all seem very invasive to the human body. We've come up with a natural method to treat the affliction," said Aaron Hodges, A.B. '21, a biomedical engineering concentrator. "We wanted to develop a treatment that is more comfortable for patients." 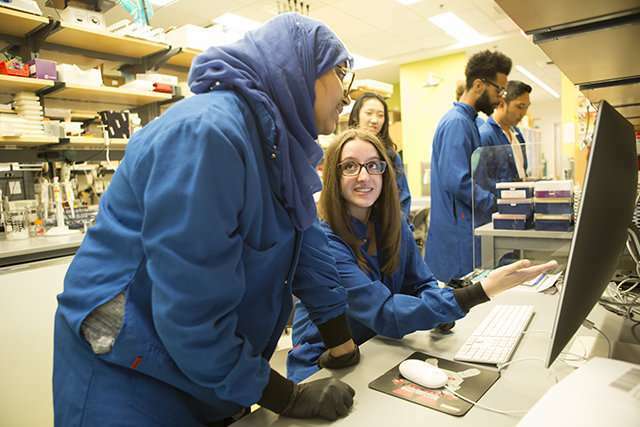 The team, advised by Neel Joshi, Associate Professor of Chemical and Biological Engineering, utilized several genes from a fungus that could encode the three different enzymes needed to break down keratin. They incorporated the fungi genes into a plasmid—a short strand of DNA— that they inserted into E. coli bacteria that had been engineered to secrete the enzymes through its outer double-membrane. They suspended the bacteria in an alginate gel, adjusting the amount of nutrients and catalyst chemicals in the solution so the bacteria secrete the right amount of enzymes over time. They aim to use this gel to produce a topical patch for patients. "Putting on a patch that secretes a treatment over time has major benefits over acid rubs or other treatments that must be applied multiple times per day," said Nathan Sharp, S.B. '20, a bioengineering concentrator. "Reducing the number of times a patient actually has to use a remedy has been shown to lead to a higher level of patient adherence." Developing the ideal composition for the alginate gel was one major challenge the students faced. Another came from the molecular cloning process, known as Gibson assembly. "Cloning is just a very finicky process in general, so it is a lot of trial and error, which is not the best kind of system when you are working on a time deadline," said Sharp. "Sometimes it doesn't work and you're not quite sure why. You can make an educated guess and try to correct it, but that is sometimes the best you can do." Patience and collaboration helped the team through those challenges, said Tajrean Rahman, A.B. '20, a history of science concentrator. When they began working on the project this summer, team members had little wet lab experience, but they worked together to develop crucial skills. During the long days and nights in the lab, the team was motivated by their outreach to the community. They spoke with a number of patients who suffer from skin ailments and doctors who regularly treat these conditions. "I really appreciated being able to reach out and talk to people who are impacted by these diseases," said Rahman. "A lot of people said our treatment method would have a really positive effect on their lifestyle and would be very meaningful to them, so that has been a really rewarding measure of our success." Though a patient-ready topical patch may be many years away, Rahman is proud of the team's proof of concept. Their work could also have applications in other fields. For instance, the pig bristle and feathers in agricultural waste often contain excess keratin that must be broken down, Sharp said. "We are revealing a field of research that should be studied more because there are a lot of potential applications," said Hodges. "With more research in this specific area, these treatments could really help people."